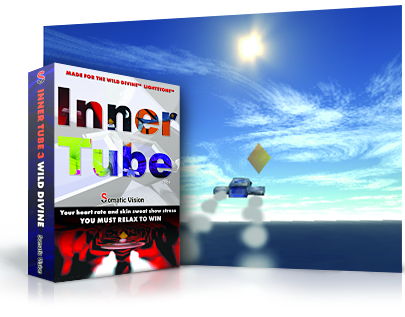 Control your spaceship with your mind with "Inner Tube 3"! Build, customize and save your own active feedback mini-games: Ship reflectivity, tunnel transparency, sky visibility, autopilot skill, fog, ship speed, background music volume and more can all be linked to your heart-rate and skin sweat, creating fun new interactivity. Inner Tube 3 responds to heart rate rhythms and finger sweat changes as measured by USB finger sensors. Heart rate and finger sweat changes are reliable measures of stress and relaxation.